Amy Steele [AS]: Why did you decide to write this book? Jacqueline Klosek [JK]: I undertook writing The War on Privacy because I was very interested in studying and understanding the effect that the “war on terror” was having on privacy rights worldwide. Ever since completing my studies, a significant part of my legal practice has focused on privacy rights. For the most part, I have worked to help companies meet their obligations for complying with laws concerning privacy and data security. After September 11th, I found that a lot of companies were finding themselves between a rock and a hard place, so to speak. Because of laws and consumer demands, many companies had been making strong commitments regarding data privacy. However, in an effort to reduce the incidence of terrorism, the government was calling upon companies to provide various data and information to the government. Companies were thus placed in a very difficult position, forced to consider whether they provide the information requested by the government or honor the privacy commitments they had made to their customers, for in many cases, they simply could not do both, as the duties were in conflict. At the same time, our government was initiating new and expanding existing information collection and use projects. Upon learning of these developments, I became interested in studying them further and also learning about how the issues were playing out around the world. AS: How is privacy defined in the U.S.? JK: There are a vast number of interpretations of the meaning of privacy. I tend to favor Justice Brandeis’s characterization of privacy as the “right to be left alone.” This definition, proposed many years ago, still holds great relevance today. This interpretation of privacy can be applied to a number of different contexts. JK: That is an interesting fact that you have picked up upon. As you have likely observed through the book, there are only a few countries in Africa and the Middle East that have enacted comprehensive privacy laws so Tunisia is certainly in the minority. Tunisia’s progressive – and protective – view of privacy rights was likely influenced by Europe’s main privacy directive (Directive 95/46/EC). This directive contains restrictions on transferring data from Europe to third countries that do not provide adequate protection to personal data. As a result of the enactment of this directive, a fair number of countries outside of Europe acted promptly to enact comprehensive privacy laws that might be considered to provide adequate protection to personal data. They did so to increase the likelihood that they would be able to continue to receive personal data from Europe and enjoy strong cross-border commerce. AS: What is needed to increase privacy rights in Africa and Middle East? JK: In jurisdictions where privacy is lacking, I think it will be important for citizens and politicians to perceive a value in privacy and a need for legislative measures to protect privacy rights. For many jurisdictions, the enactment of more stringent privacy laws is often a necessary part of the quest to advance electronic commerce, increase the use of digital health records, transition to electronic voting and undertake other initiatives that may pose a risk to information privacy and security. AS: Why is it even necessary to establish privacy rights acts? JK: That is a great question and it is a topic that has been the subject of considerable debate here in the United States. Unlike many countries, we still do not have a comprehensive privacy law here in the United States. As I mentioned above, European Directive 95/46/EC motivates many countries outside of Europe to enact their own privacy laws. While US legislators have debated whether the US needs a comprehensive privacy law, one has not yet been enacted. Instead, our lawmakers have continued to enact privacy laws to address particular perceived vulnerabilities. For example, we have the Children’s Online Privacy Protection Act (“COPPA”) to protect the privacy of children online and the Health Insurance Portability and Accountability Act (“HIPAA”) to protect the privacy of our health and medical information. AS: The book is complex and comprehensive. I think I could understand it enough to learn some things. Thank you for taking the tine with these questions. 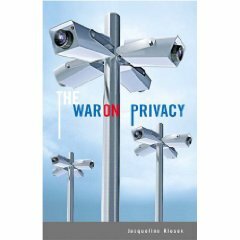 JK: Thank you very much for taking the time to read War on Privacy and for proposing these thoughtful questions. Author Jacqueline Klosek is a Certified Information Privacy Professional and attorney with Goodwin Procter LLP in New York City. Thank you to Tracee with Pump up the Volume Book Tours for arranging the interview. This entry was posted on December 14, 2009, 01:40 and is filed under Books, Interview. You can follow any responses to this entry through RSS 2.0. Both comments and pings are currently closed.